Ski holidays Auvergne : compare ! 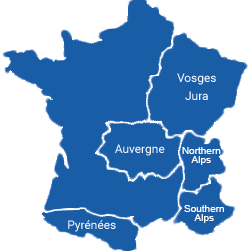 What are you looking for in the region Auvergne ? A region that’s well known for its open volcanic areas, your ski holiday in Auvergne will be spent taking part in sport or leisure activities! The winter sports enthusiasts will appreciate the equipment made available at the resorts for their ski holiday in Auvergne. Leisure activities are available for the whole family, with friendly slopes, rides dog sleds or snowshoeing. Come and ski on the large resorts of the area In the foothills of the Volcans d’Auvergne for a Ski week-end in the Massif Central or for a week stay according to your wants and availabilities. Discover the excitement of winter sports during your stay in Auvergne! Surrounded by lakes and forests, Auvergne is a rare región that contains the most vast volcanic area in Europe and it boasts a large volcanic park, called Vulcania. During your stay, you’ll have the chance to ski on the volcanoes of Auvergne and access 5 slopes suitable for all skill levels. Practice cross-country skiing in renowned resorts such as Super Besse, Le Mont Doré ou Le Lioran. Those that are more adept in alpine skiing won’t be disappointed, neither will people who enjoy dog sledding. Ski express offers you the opportunity to discover this amazing región at a low price by comparing and finding the most affordable offer among more than 50 different partner websites. Hiking and skiing are the trending winter activities in Auvergne, discover these activities during your stay in the mountains. Imagine the experience of skiing on the summit of the largest volcanic space in Europe! With numerous ski stations, quality equipment, and a región boasting the three biggest skiable mountain ranges, winter sports have never been better! When on a family holiday, whether you’re beginner skiers or familiar with spending time on the slopes, you’ll enjoy an excellent week of all-inclusive skiing in one of the resorts of the Massif du Sancy, which reaches an elevation of 1886 metres. The rentals are adapted to the needs of a family and allow you to enjoy an affordable holiday in Auvergne!